Distinguishing the Middle from Extremes (Skt. 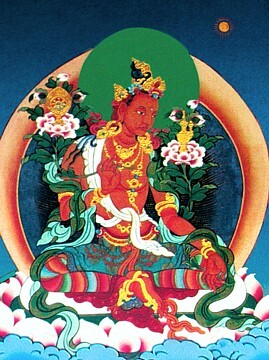 Madhyāntavibhāga; Tib. དབུ་མཐའ་རྣམ་འབྱེད་, üta namjé, Wyl. dbus mtha' rnam 'byed; Trad. Chin. 辨中邊論頌) — one of the five treatises of Maitreya. It is included among the so-called "Thirteen great texts", which form the core of the curriculum in most shedras and on which Khenpo Shenga provided commentaries. The text survived in Sanskrit in the form of a manuscript discovered in Tibet by Rahul Sankrityayan. Also the commentary by Vasubandhu and the sub-commentary by Sthiramati have been found in Sanskrit. It has been translated into Tibetan (D 4021), Chinese, Korean and English. English translation: Commentary on the Separation of the Middle from Extremes, in Stefan Anacker, Seven Works of Vasubandhu: The Buddhist Psychological Doctor, Motilal Banarsidass, 2nd Edition, 2002, ISBN 978-8120802032. English translation: Commentary on Distinguishing the Middle from the Extremes, in Maitreya's Distinguishing the Middle from the Extremes (Madhyāntavibhāga): Along with Vasubandhu's Commentary (Madhyāntavibhāga-Bhāṣya): A Study and Annotated Translation by D'Amato, Mario. New York, American Institute of Buddhist Studies 2012. ISBN|9781935011057. English translation: Annotation-commentary on the Stanzas on Distinguishing the Middle from Extremes, in Middle Beyond Extremes: Maitreya's Madhyantavibhanga with Commentaries by Khenpo Shenga and Ju Mipham, Dharmachakra Translation Committee, Snow Lion, 2007. English translation: Garland of Radiant Light: A Commentary on the Treatise Distinguishing the Middle from Extremes, in Middle Beyond Extremes: Maitreya's Madhyantavibhanga with Commentaries by Khenpo Shenga and Ju Mipham, Dharmachakra Translation Committee, Snow Lion, 2007. A Study of the Madhyāntavibhāga-bhāṣya-ṭikā, by Richard Stanley. Doctoral dissertation, Australian National University, April, 1988. This page was last edited on 3 February 2019, at 10:37.